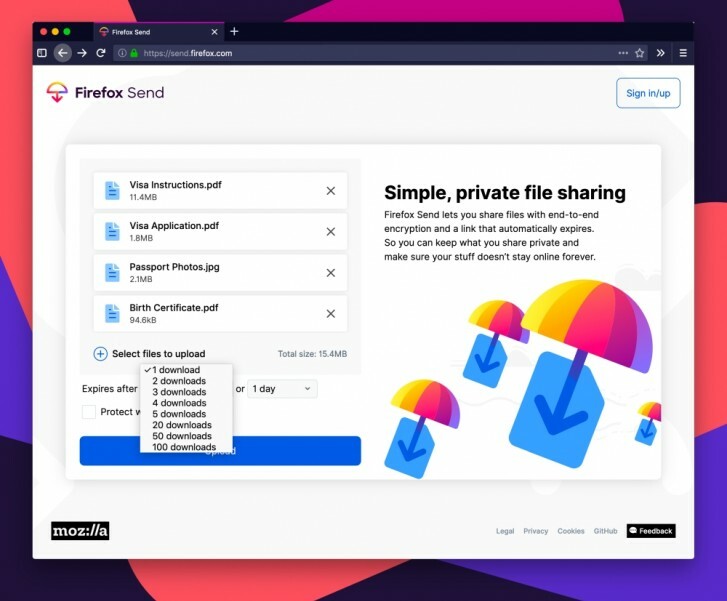 Mozilla has launched Firefox Send, a free file sharing service where users can upload files to the service and then share the URL with others. Users can upload files up to 1GB at a time or create a free Mozilla account to upload up to 2.5GB. Once the files are uploaded, you can choose how many times the files can be downloaded by the recipient (up to 100 times) before the link expires. Alternatively, you can instead choose a time period (up to 7 days) after which the link automatically expires. To make it even more secure, you can add a password to the link and share the password along with the link so only people with the link and the password have access to the files. Firefox Send is ideal if you want to quickly send files to someone but they exceed what you can normally send over email. It also beats uploading it to a cloud storage service like Dropbox as then the files permanently sit there and you would need to manually delete them. For files that are not important enough to be stored permanently or accessed by many people, this is an ideal solution. As with everything Mozilla, the service is free and available at send.firefox.com. Won't get attractive for "pirates": 100 downloads or one week is simply not enough. And they won't earn money for downloads.